Dr. Harold W. See served as the catalyst for and as the founding leader of Southern Illinois University Edwardsville. Harold See was hired effective September 1, 1955 to direct the Residence Center program for school teachers operated in Belleville, Illinois, by the extension division of the university system. 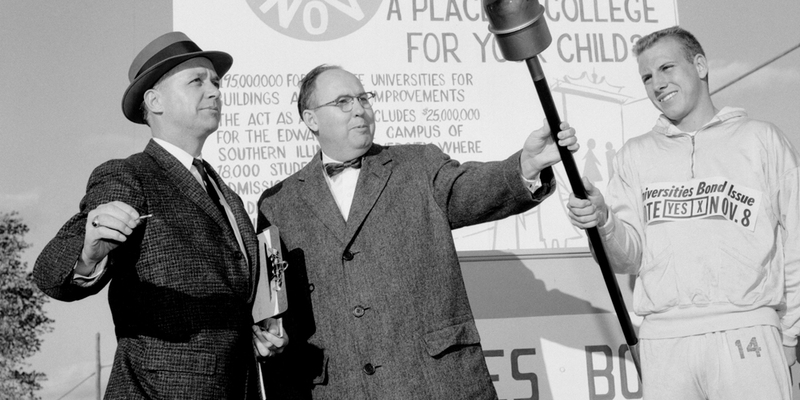 At that time, progressive citizens of the Southwestern Illinois region were determined to gain access to public higher education for themselves, their children, and their employees. While successfully expanding the Belleville residence center, Harold See became the friend, confidant, and behind-the-scenes advisor to these activists. See worked closely with them to form the Southwestern Illinois Council for Higher Education (SWICHE) as an organizational vehicle to advocate for their cause. He persuaded system President Delyte Morris to work with SWICHE leaders, to seek support from Governor William Stratton, and to obtain funding from the state legislature to operate new residence centers in Alton and in East St. Louis. The SIU Board of Trustees on June 25, 1957, created the new position of Executive Dean of the Southwestern Illinois Residence Office to facilitate See’s administration of the Alton and East St. Louis residence centers. In this capacity, Dean See hired the founding faculty and staff and guided the establishment of SIUE. See simultaneously worked as the researcher and ghostwriter for a carefully-documented study that demonstrated the need for improved access to public education in the Metro East. His skill in managing explosive enrollment growth predicted by his research prompted further promotion for See in April 1959 to the new rank of Vice President for the Southwestern Illinois Campus. Vice President See skillfully coordinated the private SWICHE drive to raise funds in order to purchase property near Edwardsville for a new central campus. In December 1959, See moved his administrative office to one of the tract houses on the emerging campus. He orchestrated the effort to convince local legislators to assist in placing a multi-million-dollar bond issue for higher education improvements on the November 1960 statewide ballot. He also managed the electoral campaign in Southwestern Illinois that led to voter approval of the bond issue which financed new public university facilities in Chicago (UIC) and Edwardsville (SIUE). During his three years of remarkable leadership (1957-1960), Harold W. See set the stage for the university’s subsequent success on the Edwardsville campus.